Like a fair few folks I know, I don’t really get excited about meat. I’ll eat it, and enjoy it just fine, but it doesn’t ring my chimes the way, say, an over-medium egg yolk does. For me, at least, it’s a texture thing: I like the flavor and richness of meat, but not the way it feels under my teeth. For the most part, when I cook with meat, it’s as a component of a larger and more complex dish, rather than simply a piece of animal on a plate. The joy of a juicy, medium-rare steak or a lovely Sunday roast is mostly lost on me. When that meat is braised, though, all bets are off. I love me a tender hunk of falling-apart meat. I grew up eating brisket braised in red wine every year for Passover, and it was basically the only time of year I’d willingly eat red meat. When a piece of tough, bone-in beef or lamb gets cooked for hours in a powerful liquid, it turns into something totally deserving of swoons. Stick a fork in, and the meat falls into tender strands. The liquid and the meat juices become thick, gelatinous, slow-moving on the tongue. There’s barely any chewing required, and so much more flavor and interest than a simple steak can muster. Of all the braise-able cuts of meat, I think lamb shanks are my favorite. Cook a lamb shank for long enough, and the meat becomes soft, almost cushiony, and relaxes away from the bone. It’s juicier and gamier than many braised beef cuts I’ve had, and it plays remarkably well with explosive flavors from around the world. I’ve had a Thai curried lamb shank, and a Moroccan lamb shank tagine, both of which blew my mind. But when I wanted to make a special dinner for Sam recently, I decided to go for something simpler, using two of my favorite flavor partners with lamb: pomegranate and rosemary. This is the kind of dish that takes practically forever to cook, but almost all the time is hands-off. I stuck the lamb in the oven for a few hours while I was working, and it perfumed my little dining room office most distractingly. You could turn up the oven temperature and braise for less time, but I love meat cooked like this, as slowly and gently as possible. 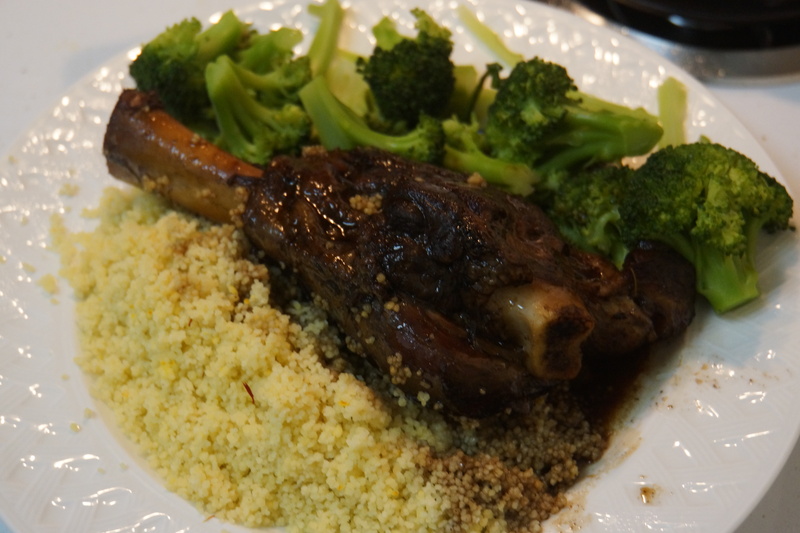 You can reduce the braising liquid right down to a sticky glaze, if you want; I left mine a bit saucier, the better for spooning over couscous. Not only was the meat exactly how I love it–tender, plump, nearly falling apart–but the sauce itself was phenomenal, sweet and sour and slightly resiny from the rosemary. This one is a keeper. I’m normally pretty bad at resisting the lure of processed food. (I’m currently typing this blog post with one hand and eating honey mustard pretzels with the other.) But there is one consistent exception. One of my favorite food websites, The Kitchn, recently ran a blog post titled “How My Freezer Replaces Canned Soups.” I read it and found myself nodding vigorously the whole time. I may be pretty lazy most days, but I’ve pretty much stopped trying to convince myself that a can of soup is a satisfying dinner. It’s freezer soup all the way these days. I’ve written about this before–how I love stocking my freezer with the building blocks of meals. It’s a habit I got into when I was living alone, working long days and commuting over an hour each way. At any given point, my freezer usually has some homemade chicken or turkey stock; a couple different kinds of soup, stew, or curry; and a double batch of tomato sauce. (Lately I’ve been adding little containers of sweet potato filling to my stash as well.) If I remember, I’ll take a portion out of the freezer the night before I want to eat it and let it partially thaw in the fridge; if I forget, I’ll run hot tap water over the frozen container just until the contents release from the sides. It takes nearly as little time to reheat frozen soup as canned, and it’s just as quick to eat. This is the point at which my boyfriend would accuse me of being philosophically opposed to canned soup, and claim that I’m judging him when he chooses to eat it. That’s really not it at all, though; if it works for Sam as a quick and filling meal, then I’ll happily keep cans of his favorite soups in the house. But for me, canned soup no longer really registers as food. When I eat a can of soup for dinner, I’m never really full afterward; my body doesn’t seem to register it as a meal, and I find myself hungry again in less than an hour. It’s just so much more filling and satisfying to eat something I made myself and tailored to my own tastes. This chili is a great example. I’ve had bean chili out of a can more times than I can count, and most of the time it’s perfectly okay. But to have my very own three-bean chili squirreled away means I’ll actually enjoy the meal when I heat it up. 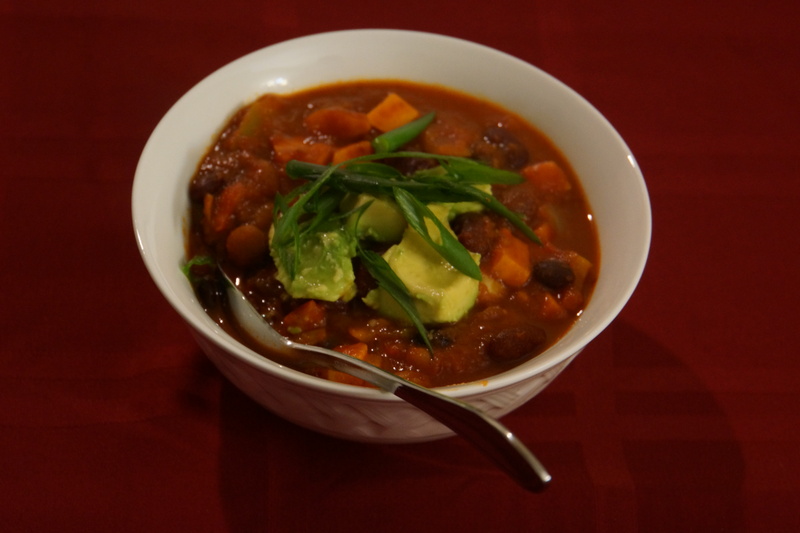 This is a chili made to my specifications: smoky and brick-red, studded with chunks of sweet potato and shot through with enough heat to make my nose run. I froze some leftover cornbread alongside, so that I could have a wedge of something crumbly to stick in my bowl. I also love adding some big chunks of avocado and a scattering of scallions on top, for buttery smoothness and oniony crunch. But even without the extra toppings–even just scraped out of a freezer container and microwaved–this chili is miles away from the stuff in the can.